Today started off with a chat with Ed, then my toast made a surprise reappearance (what a waste of peanut butter *sighs*), then finally managing to get out of bed and shower. After that I sat back on the bed and have been here with the laptop ever since. The best thing to tell you today is that I am officially HALFWAY through my intense months of chemo in hospital!!! Two blocks down, two to go! My hair is getting really thin now and I am hoping it gives up the ghost soon. I know that sounds wrong but honestly you’d feel the same if yours was coming out so slowly! I was expecting it to go a little faster and now it just looks limp so I want it gone! I am quite interested to see what I look like bald too and I want to start using my beanie and wigs! Saying that, I also really miss when it was thick and long and alive… I just don’t like it how it is now! My biggest hope is that it grows back curly, or at least a little wavy. Fingers crossed! 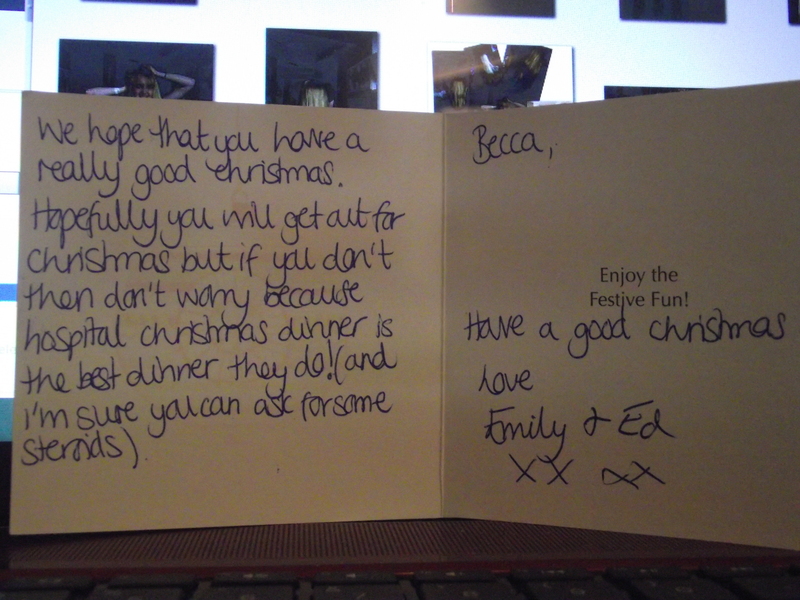 I will leave you with my encouraging Christmas card from Ed and Emily.